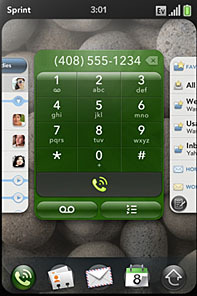 With all of the attention on Windows Phone 7 Series' lack of true multitasking, we wanted to point out that figuring out multitasking on webOS is still a work in progress. Being able to do background processing is one thing the webOS is know for. So when 1.4 changed how background processes worked, developers took notice. Absent from the list of 1.4 changes was an alteration that widely affected applications that work in the background. Thankfully Palm's own Gray Norton popped in to the Palm developer forums to apologize, admit the situation was mishandled and attempt to increase the developer communication. Gray then proceeded to outline the entire situation and what is being done about it. He even hinted there'd be a webOS update within 2-3 weeks at the earliest to deal with the matter (changing it from 15sec to 60sec). Well worth a read if you're a developer. The conversation then continued and brought up an interesting question: how should background applications on the webOS work? Should they stay as it is with a set timeout termination (for background apps with no dashboard/active banner), or should there be free reign on completely background running apps? Should be some sort of official built-in process manager? If so, should the average user have the ability to forcibly shut down background apps doing their thing? What you're opinion on the matter? Comment below and tell us, or if you're a developer, hop on by the Palm developer forums and tell them what you'd prefer.